A record crowd of over 10,000 enjoys NightBEAT 2017. 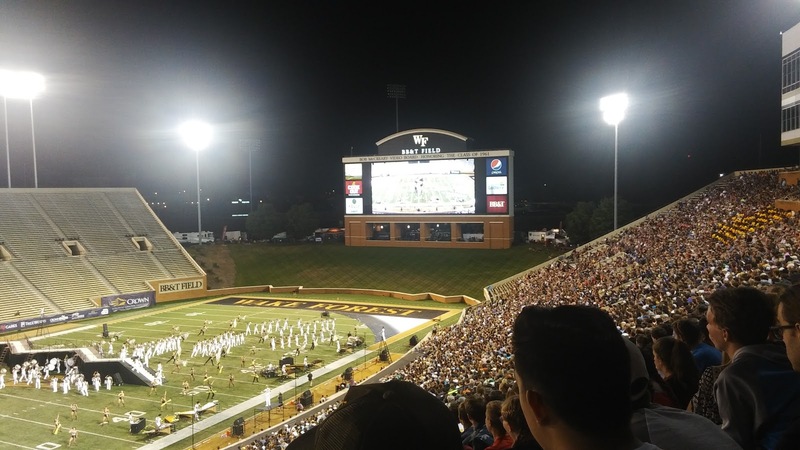 My case for NightBEAT - Carolina Crown's home show and Tour of Champions event in Winston-Salem, NC - has been pretty well documented. But this year's edition was just about everything a fan could have asked for. The weather was amazing. Last year, rain curtailed the show. The year before was as hot as one might expect. 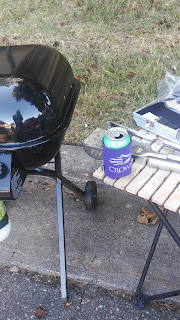 But this year was perfect - so much so, in fact, that I reversed course on the plan not to tailgate and packed the grill and the cooler after all. With two kids - a six year old and a three year old - I've shied away from tailgating the past couple of years. Both time in the heat and attention span being considerations, it didn't make sense to spend time in the lot and then head into an open stadium that would offer no respite. But with the agreeable weather, we headed out that way with a friend who was traveling with us. We even had DCI Twitter luminary Momma DCI and her husband, who were down from Wisconsin for the show, stop by. Once inside the stadium, the mild temperatures meant it was no burden to be outside of the welcome shade of the press box. Because the show's original function was as a Tour of Champions show, the mid-majors took the first half, pre-INT. Before the first notes were sounded, however, we were treated to a parachute team, because the CrownEVENTS crew always brings their A game. While I knew of many of this season's uniform changes, seeing them in person was its own experience. Phantom in black, Troop in cream, and Madison and Boston looking far from what we expect. Uniform watch aside, this year has its share of enjoyable shows. Unfortunately, no one in our party was able to weigh in fully on the Bay Area battle that's been brewing all season - my wife missed Santa Clara immediately after intermission, and I took the kids to the restroom during Blue Devils. Still, catching 13 out of 14 shows wasn't bad, and NightBEAT in Winston-Salem continues to impress.